Listening to great performers and how to become one! 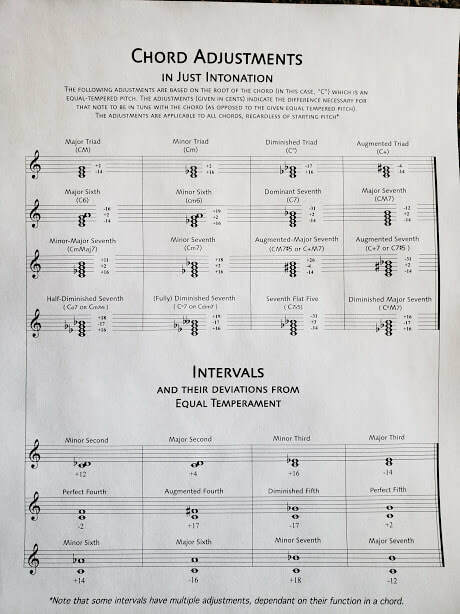 Intonation: playing in tune! This is incredibly important. The notes have a specific Hz such as bands normally tune to A440Hz which means the A we use has a frequency of 440Hz. In some parts of the world they use 432Hz so that would be flatter than the pitch we use. Orchestras often use 444Hz so a little higher than a band. The reason I'm telling you this is just because you are in tune with the tuner in front of you, that doesn't mean your right. Another thing to keep in mind is that it matters where you are in the chord. The following chart gives a good idea of what to do with your note in the chord. Here's a link to a few options for working on ear training. Once you spend enough time on it, it will be second nature. Practice at a tempo you can play it perfectly and move the metronome up 2 beats per minute after you've mastered the difficult passage until you can play it a bit above performance tempo. Sometimes, you'll get a guest conductor or just some nerves going and you'll have to perform it at a tempo faster than you've ever done before. Such fun! Articulations: study the correct way to articulate not just as marked but as the style of the music dictates. You wouldn't play Mahler the same way you play in pep band. Timing; Play the notes exactly when they are supposed to be. Work with a metronome and become an expert at subdividing beats. Silence is part of the music as well. Dynamics: work on playing in tune from a whisper to FFFF (blastissimo) Always keep in mind; you're making music! Not noise! After you've mastered the 3 "T"s ; tone, technique and timing, you are ready to start to make music! Study the different composers and what they are trying to convey with the notes on the page. Not all composers see a /\ the same way. A quarter note in jazz is different than a quarter note in classical. You will never run out of ways to improve. That's one of the things that makes music fun! jazz bassoon "Take 5", one of my favorite tunes! Many of the great books such as Arbans and Clarke have tips and ways to get the best practice techniques from various great teachers. It's a good idea to take a look at these suggestions and see what works best for you. None of these recordings have been "touched up." In some chords, we cover 8 octaves! Most impressive was not only the high range but playing clean and in tune way in the basement! "Sarah's horn hangouts," has a ton of great horn stuff.